Tilicho lake is one of the highest lakes in the world.It is 4,949 m high in the Annapurna range of the Himalayas in Manang district of Nepal .Another source lists Lake Tilicho as being 4,919 meters high (16,138 feet). 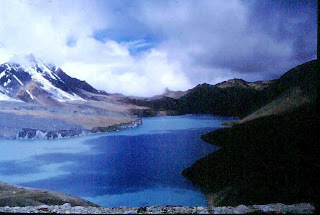 Mountain lakes are known to geographers as tarns if they are caused by glacial activity. 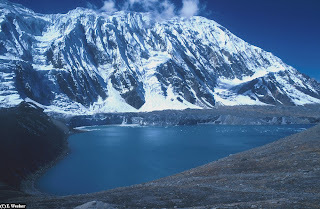 Tarns are found mostly in the upper reaches of the Himalaya, above 5,500 metres. Due to the extremely inhospitable surrounding terrain and the difficulties associated with reaching the area, this lake is rarely visited by outsiders. It was also the site of one of the highest ever altitude scuba dives. A Russian diving team consisting of Andrei Andryushin, Denis Bakin and Maxim Gresko conducted a scuba dive in the lake in 2000. 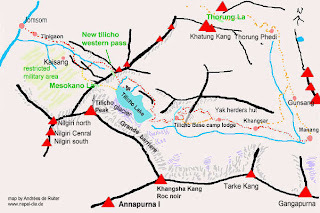 Trekkers attempting the Annapurna Circuit route usually cross the watershed between Manang and Kali Kandaki valleys over the 5414 meters high Thorong La pass. The alternate route skirting Tilicho Lake from the north has been gaining popularity. This route is more demanding and requires at least one night of camping. New lodges have been built between Manang and the lake, but there are no teahouses or lodges past the Tilicho BC lodge some kilometers east of the lake and the next village of Thini Gaon in the Kali Kandaki valley. Most groups spend two nights between these places. There are two passes leading to Thini Gaon and Jomsom; Mesokanto La and Tilicho North pass known also as Tilicho "Tourist pass". 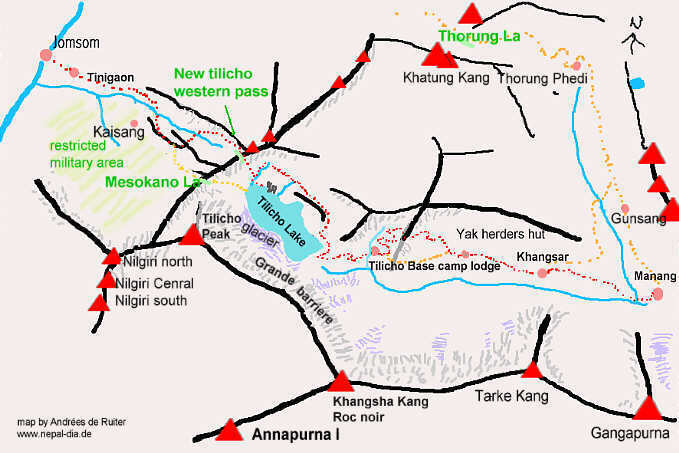 These routes via Tilicho Lake are more often closed by snow than the higher Thorong La.